Just arrived on Xbox Live today are two new demos. Eternal Sonata from Namco Bandai is likely to satisfy all those eager for a JRPG on Microsoft\'s console, and Vampire Rain, which is, something else entirely. I personally am excited for Eternal Sonata, as I haven\'t played a JRPG in some time and it looks fantastic from previews. Their website contains more pics, videos, and samples of the beautiful score. I\'m less excited for the universally panned Vampire Rain, where you\'re an elite special forces unit sent to thin out the vampire ranks. Unfortunately fellow gamers in Europe seem to be getting the shaft again, the Eternal Sonata Demo is not available in Europe and the Vampire Rain Demo is not available in the States - strange. [ESRB: RP (Rating Pending) Now is your chance to play this year\'s highly-anticipated RPG, Eternal Sonata, with a free demo available on Xbox Live? Marketplace.Developed for the Xbox 360TM video game and entertainment system by Tri-Crescendo and featuring the music of Chopin, Eternal Sonata delivers amazingly detailed 3D graphics, a captivating storyline with over 30 hours of gameplay and an innovative action battle system. Download the demo today and explore the Path to Tenuto, Tenuto Village and Heaven\'s Mirror Forest with Polka, Allegretto and Beat. Get a glimpse of the world that is Eternal Sonata. 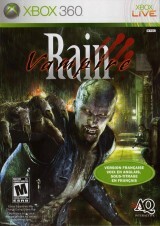 [ESRB: M (MATURE) Blood and Gore, Intense Violence] Vampire Rain combines stealth, survival horror and shooter aspects of your favorite games as you lead a black ops unit to secretly eliminate the deadliest supernatural enemies you\'ve ever faced. Nightwalkers are intensely fast with super agility and they are converting humans to their kind at an alarming rate. Traverse all areas of an eerie and rain soaked city by moving across rooftops and through back alleys to avoid detection and enable the best strategic use of your weapons. It\'s up to you to protect the innocent and find the evil source of this invasion before it\'s too late. Demo includes 2 full missions and 2 experience trials along with an Xbox Live multiplayer experience unlike any other where you can experience the power of a Nightwalker first hand.